As one of the most popular VPNs in the world, VyprVPN is a service provided by Golden Frog, an Internet privacy company founded in San Fransisco in the Untied States. In addition to VyPrVPN, this company also has a secure online storage product called Dump Truck and a encrypted messaging product called Cyphr. In this VyprVPN review, we will cover VyprVPN’s features, server locations, security, price, connection speed and customer support etc. Free trial limits to 3 days. Free Trail: 3 day free trial. Number of Simultaneous Connections Allowed: 3 to 5. 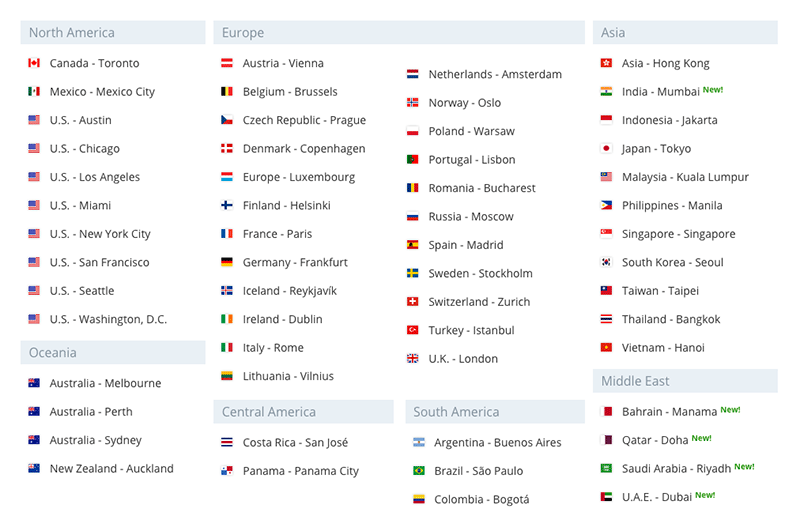 VyprVPN has 700+ servers located in North America, South America, Europe, Asia and Oceania. There’re 200,000 IP addresses available for their VPN users. While many VPN providers rent 3rd party servers, all of VyprVPN’s servers are owned, engineered and managed by the company itself, allowing VyPrVPn to deliver faster and more reliable services, as well as to offer more privacy and security protections. VyprVPN supports the following VPN protocols: OpenVPN (TCP, UDP), L2TP/IPsec and PPTP. Recently VyprVPN developed a modified OpenVPN 256-bit protocol called Chameleon, which was designed to defeat Internet throttling and VPN blocking by making the VPN traffic hard to be recognized via deep packet inspection (DPI) by ISPs, governments, and corporations. Please note that Chameleon is not available for VyprVPN’s basic account, but is included in their premium plans. VyprVPN offers unlimited speed and unlimited server switching. VyprVPN does not block any types of Internet traffic, thus allowing P2P/Torrent. For simultaneous connections, VyprVPN’s Basic plan allows 3 device to be connected at a time. Its Premium plan allows 5 simultaneous connections. Only VyprVPN’s Premium plan supports the Chameleon protocol. VyprVPN offers two plans: the Basic plan and the Premium plan. 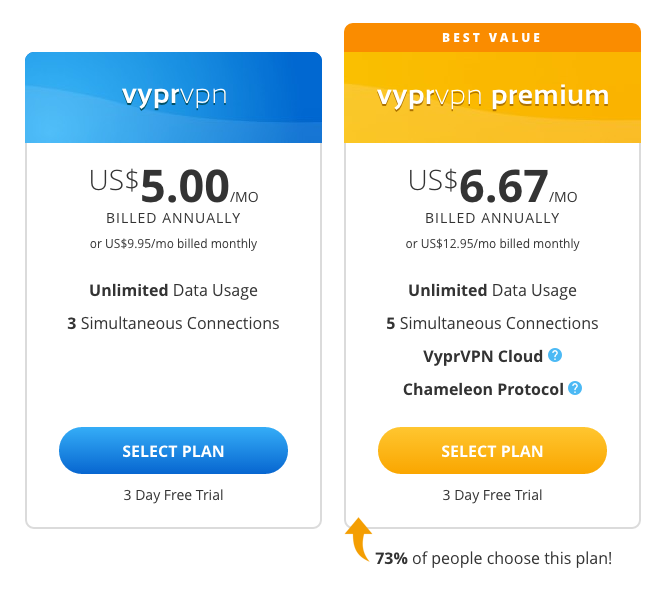 The Premium Plan costs more but offers more simultaneous connections and two additional features: the Chameleon protocol to defeat VPN blocking and the VyprVPN cloud feature to allow users to use their own server as a VPN server. VyprVPN offers a 3-day free trial for users to test out their VPN service. VyprVPN provides free VPN software for Windows, MacOS, iOS, Android, TV and supported routers. In addition, its VPN can be set up manually on these operating systems and devices. 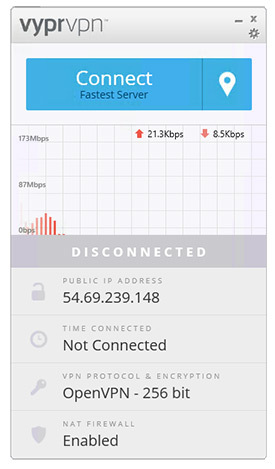 With VyprVPN’s client software, users can connect/disconnect VPN, as well as choose server locations and switch between different VPN protocols. To help users select a better server, this software can automatically run a ping test and show the results along with their server names (the lower the better). If the user doesn’t want to select a server himself, there’s an option available to connect to the fastest server, which is determined by the software. We found VyprVPN’s software is very user-friendly and very easy to use. Ping: 14 ms, Download: 68.77 Mb/s, Upload: 11.80 Mb/s. Ping: 16 ms, Download: 51.23 Mb/s, Upload: 11.02 Mb/s. Ping: 91 ms, Download: 38.54 Mb/s, Upload: 10.35 Mb/s. Ping: 53 ms, Download: 35.51 Mb/s, Upload: 10.93 Mb/s. Ping: 90 ms, Download: 24.18 Mb/s, Upload: 10.82 Mb/s. Ping: 231 ms, Download: 37.55 Mb/s, Upload: 3.94 Mb/s. On VyprVPN’s website, there’s a live chat window where you can connect directly to VyprVPN’s customer support team. We tried using this method to get support and we were able to connect to a support representative immediately. We were able to get our questions answered using live chat. VyprVPN’s customer support is among the best ones we have seen. As one of the most popular VPN providers, VyprVPN provides stable VPN connections, fast VPN speed, multiple worldwide server locations and easy to use software. VyprVPN’s speed is among the fastest ones we have tested and their customer support is very responsive and helpful. 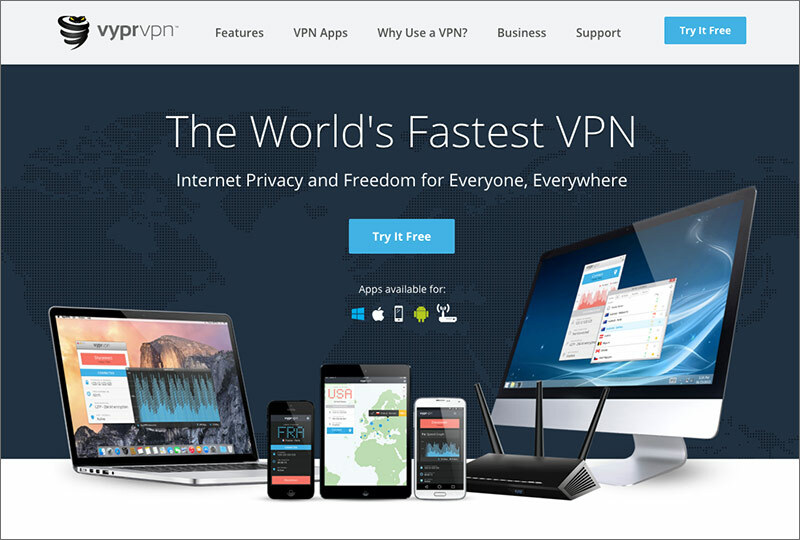 Based on our tests, we have included VyprVPN in our list of the best VPN services.